Despite my relatively young age of 20, I’ve had my fair share of business ideas. The majority have remained ideas, yet others I have invested hours and hours of my time into, with the intention of creating something really great. Sure, it would be great to make money along the way, yet the driving force is the fact that building stuff is FUN. I’ve decided the last few months to learning as much as possible about how to build a company, from a startup to a fully operational business. Fortunately, I have a brother who has the same passion, yet has complementary skills (Boooya!). Last year we won some money for a whitewater rafting video startup, and this year we are focused on aerial photography & videography. We are current finalists in the UMaine Business Challenge, with the winner walking home with 5k in cash. It’s just enough for us to scale our operations from a prototype, to a fully operational business. We are working with some extremely innovative technology, so there’s a huge opportunity in the market right now. 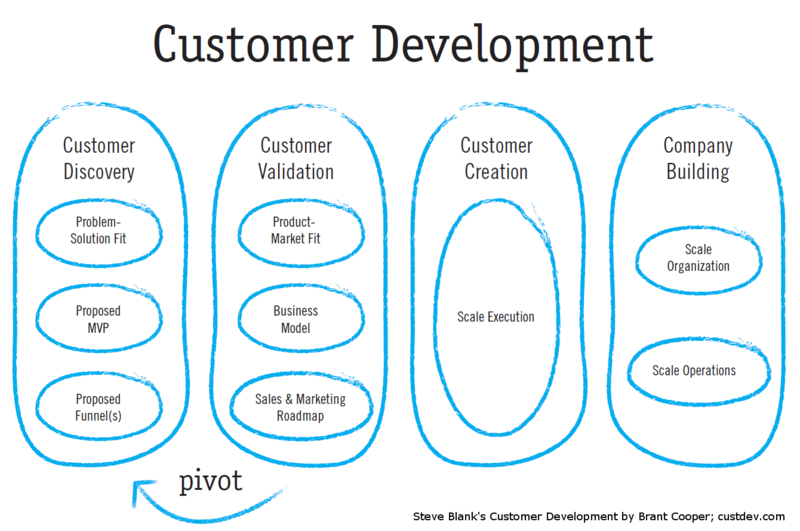 I’ve been reading up on some of the content Steve Blank has been pumping out over the past few years, as well as The Lean Startup, and Running Lean, and I’ve been blown away. The content in these books is absolutely incredible, and I’ve learned how horrible my assumptions and plans for building a company are. I’ll do a quick recap.. I don’t have problems thinking up ideas that I think would be successful. The problem is that customers don’t care what I think. If my product or service isn’t solving a problem, it’s completely useless. Put simply, I’ve been creating things that I want to use. I’ve been relying on where I believe the market opportunity is. On Day One, the startup is a faith-based enterprise built on its founders’ vision and a notable absence of facts. The founders’ job is to translate this vision and these hypothesis into facts. Instead, I should be “getting outside of the building” and talking with potential customers, seeking to find pain points, and looking for where the opportunity lies. This doesn’t mean simply sending out a survey, but instead, engaging in dialogue. a survey can only validate an assumption. If you really want to understand your target market, you must TALK TO THEM. Humans have a fear of failure. We want to get things right the first time – I’m the same way. It’s okay to be wrong! How you learn from your assumptions is the important part. That’s why it’s important to learn from mistakes, and adapt the business model to reflect those changes. When something isn’t working, successful founders orient themselves to the new facts, decide what needs fixing, and act decisively. While it’s extremely important to do your homework and find the pain points that customers experience, it’s also important to validate that you have a product that they would be willing to use. That’s where the importance of having a prototype comes into play. It’s important to show them what you have created, even if it still is a work in progress. Don’t stress over the small details, and don’t focus on your energy on adding every feature that customers ask for. The purpose of the prototype is to highlight the value proposition – don’t cloud it out by adding all those cool extras and add-ons. Next, what’s a product without paying customers? This is where Customer Validation is so important. “Customers” will be willing to use your product, but not willing to pay for it. If that’s the case, perhaps you should refine your price point, or seek to find a market where customers will actually pay. Customer Validation puts quite a bit of stress on your business model, so expect resistance and remember to adapt quickly. In a single-sided market (one where the user is the payer), a steady stream of customer purchases validates the concept far more solidly than lots of polite words. This is only the beginning of my learnings, I’ll keep you posted as I continue to learn. I’ll be posting a future update where I break down how we are using these methods with Aerialfly.